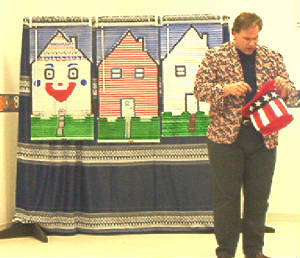 CoCo The Clown is loved by children all over the country. She offers a variety of exciting services. She tells some of the most hillarious stories that you'll hear anywhere. 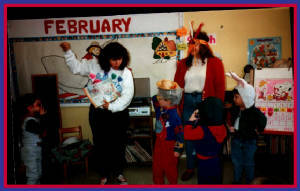 You won't believe you eyes as the children dress up and play the parts in the stories she tells. CoCo can also teach a clowning class. Yes, your young people will learn how to become a clown. make-up, juggling, and learning how to make a balloon animal are all part of thie exciting program. A Clown is born is an exciting program that features Kathleen coming in to your facility and becoming a clown right in front of your eyes. Watch as she tells you about clown while putting on her make up and costume. This program has been very popular at daycares and nursing homes. This is a story that teaches the importance of being yourself. We all know that peer presure greatly influences our young people today. This program teaches that the we don't have to be like anybody else to be acceptable. The fact is we're perfect just the way we are. Watch as I transform myself into 3 different charcaters as I tell the story of Sameville. Sameville is a place where nobody dares to be different. Everybody just acts the same as everybody else. The children's faces light up as this transformation takes place right before their eyes. In the end they learn that they need to be themselves. 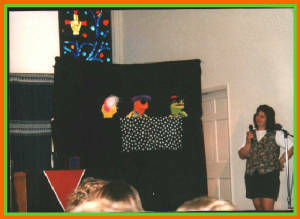 Puppet Power is a fantastic program that children and adults alike just love. These puppets get into all kinds of trouble that the children help them get out of. These characters sing all kinds of songs that teach about important issues. Some of these issues include: What to do if you get lost. Being careful of strangers and practicing good safety rules. The children really listen to everything the puppets say. This is a great prgram that fits easily in to any teaching type atmosphere. Call us today and reserve your dates. Each year I turn down many programs due to prior bookings. In fact, it's a good idea to have a couple of dates in mind when you contact us. There's a good chance we'll have to search for an open date. Please call us now while it's still fresh in your mind. What's All This Fun Going To Cost Me?. I Know What You're thinking. "What do these programs cost"? To answer that I need more information from you. Just click the BOOK Mr.J LINK below and fill out the web form. I'll get back to you ASAP with a price quote. "The entertainment by Mr. J was one of the highlights of our Head Start Carnival. Although our children are still quite young, you were able to hold their attention for a long time. This is cetainly a tribute to your obvious connection and ability to entertain children of all ages. Not only were the children entertained but so were their parents..."
"Kathleen arrived early and was ready to go as scheduled. She was very bubbly and her enthusiasm was catchy. The children really, really enjoyed her. She especially made friends with one little girl who was terrified of clowns. By the end of the program she did not want CoCo to leave." "CoCo was well received by everyone at the program. she was quick, entertaining and funny. She did face painting and balloon animals as well as some funny magic. everyone was having an enjoyable time . we'd love to have her perform here again." "We enjoyed your performance very much. You kept the kids attention and made them laugh. You also had the older kids and residents attention as well. Everyone was laughing and enjoying the show. " I guess were all kids at heart". I would love to hire you again and will refer you to people looking for good entertainment. Thank you for a great show." "I want to thank you for performing at our child care center over the last ten years. Our children have loved every moment of it. Your expertise and wonderful sense of humor have kept our children and adults in stitches. Thank you for your professional and friendly entertainment. You are truly a master of your craft. Please feel free to use me as a refrence." Children are always involved in the program! As you can see the audience is very much involved in our programs. We know they love to be a part of the action. You count on us to create memories that will last a life time. It's not uncomomon for young adults to coame up and tell me "I remember you from when I was a kid". Call and let us create some memories for your group. Click Here For Some Great Party Supplies.